A Daily Diary: Dreams, Both in Sleep and Life. Dreams, Both in Sleep and Life. 1:07 p.m. Last night, I hung out with April until she finished off her Vodka. I did not, myself drink, but did enjoy some lovely videos with her on organizing. Ahhh, the beauty!! I could easily consider NOT writing today but I dream to JRM again, which obligates me to do it. The dream, kid you not, does not even make sense. P.S. Watched the Walking Dead finale this morning, had a few gasps, but it wasn't mind blowing to me. I've been up since around 11 a.m. and fed the cat..and I snacked. My stomach has been hurting again. Alright, so in this dream I only remember watching one of Hissy's (my cat's) kittens suckle on her mother and we, JRM and I, made ourselves REALLY super duper tiny, like the size of a flea and him even smaller and we tried to lead her on. By the time we got to normal size, still trying to lead her, she became a spider. Later, we were on my porch and she had become a large python...which I was wondering how he could hold her so non-chalantly without a fear of getting bit but he was completely comfortable. He took the python away and it was soon following him down my Mom's driveway, after which I cried "Watch out!" but again, didn't mind. He made it across the street to the yard across from us and I followed, observing some event going on down the street by the col de sac. I noticed a red phone box from England down there as well. When I asked what was going on, I think he, or someone else, told me that it was some kind of family business. That's all I remember. I had another dream where I celebrated passing my Senior year of high school, in some restaurant, and getting a hold of my Mom to tell her. In ANOTHER dream, I went shopping and tried on some clothes, including this pretty red tiered halter top and other things. Then I got locked in after closing. I was later babysitting and tried to get ahold of my Mom, with my low phone minutes, and let her know why I never came home the night before. It took a few tries via calling and attempted texting before I could let her know. Meanwhile, I was babysitting some kids here...as if this was their home. I next remember being in some bedroom and unpacking all sorts of things from full blankets and pillows to Barbie dolls, grouping them together, out of a backpack. And then I had to realize how I was going to get ALL of that back in there and couldn't see how I got it in, in the first place. That's really all I remember. I am STILL telling myself I want to draw but I don't know what. I want to edit The Dream Doctor again at some point and I want to finish off my book. Exercise, too. I have goals, menial as they are. I got my fire blumaroo avatar today, so I'm happy about that. Adopted her out right after, right away. So praise the Lord, I got to make someone's day. April and I didn't watch Clueless. I'm not gonna pressure her into it and if she doesn't want to watch, then it's not that fun anyway. She HAD to remind me it was once a television show though, like oh my God I forgot! That's it for now. God bless, Jesus died, rose, saved. Bye. 2:17 p.m. I know I was supposed to wait two weeks but I have to lose the yellow-orange blonde hair. I just busted open the Revlon Colorsilk in Ultra Light Sun Blonde and I'm putting it through a 45-minute strand test. Last time, my strand test yielded darker results than what resulted in my actual hair but I'm still hoping for a success. 2:34 p.m. Just used my phone minutes to talk to Dad lol. All of them. 2:43 p.m. Dad called on Facebook, which is a new Skype type of thing...I told him to get Skype but he's reluctant. Still it was great talking to him again. 3:26 p.m. I just got the dye in my hair. The strand test revealed that it went only one or two small shades lighter than my hair was..when damp the difference was barely noticeable..but when dry it's definitely blonder, especially when compared with the result of the strand test from the first dye bottle around last week. I may leave it in longer, to go lighter, and we'll see what results then....in the meantime, I should amuse myself somehow. P.S. It also itches a bit, but no more than what lice shampoo did months back, so I can take it for the next hour like a champ. 4:43 p.m. Okay, so there was barely a change but it's not a total loss. It was only a three dollar box of hair dye anyway. So, it's still a yellow blonde...just a bit less orange. I'm glad it's over with. 5:28 p.m. I watched some Youtube videos, April made us hot dogs, and Rob mourned that we just lost a few pounds of raw beef after accidentally leaving it out for two days. MEANWHILE I've started the first three chocolate layers of what will be April's very tall chocolate and vanilla BELATED birthday cake in the oven. This should be something very, very special. God bless, Jesus Loves, Lives, Saves, homies. That is all for now. 6:13 p.m. Next step, with April's help, the vanilla tiers have gone in and I can't wait. I saw the vanilla batter and couldn't help but notice that it was the exact same shade as my hair is now. Who knew trying to go from natural dark brown to blonde could be so hard?! 7:37 p.m. IT'S FINISHED! Sloppy yet successful. 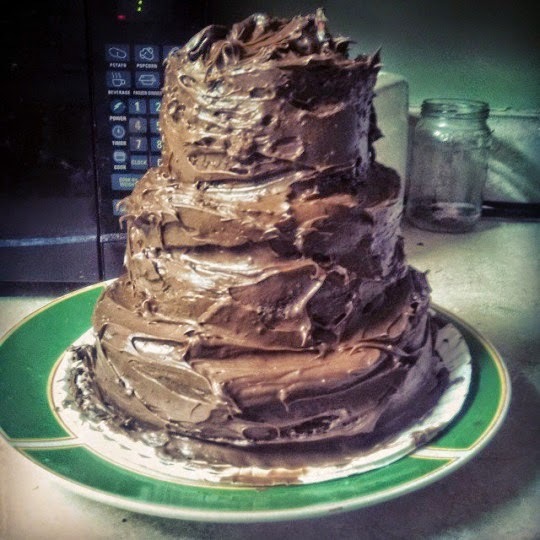 You would not find this on an episode of Cake Boss, for sure. EDIT: We had pizza with pizza rolls on top, then watched Clueless and ate cake. April took a break form it to work on her project, and then frustrated over. I played on StumbleUpon until Rob and Jess were making whining noises back and forth and all I wanted to do was get away for quiet. April came in my room a moment later to check on me, we shared out frustrations and went back to the movie, which April kept guessing parts coming up correctly (though she never saw the film) and afterwards, I headed to bed when it was close to midnight. Oh, and last night I played with the bonfire lol, yes another one.